Wipe the meat, cut it into small pieces and mix with the seasonings, chopped egg and stock. 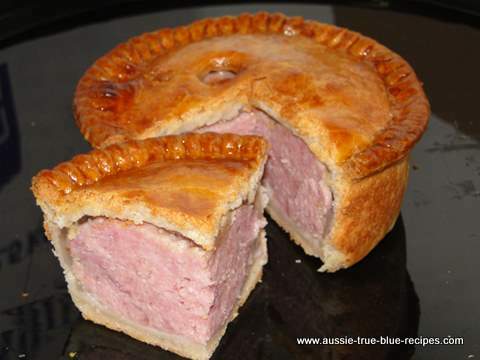 Make the pie as already described, and put the meat in the case, making sure there is enough stock to cook the meat. Put on the lid and arrange a band of paper round the pie, to keep it a good shape. Glaze with beaten egg and bake in a moderately hot oven for about 1 hour, then reduce the heat to moderate and cook until the meat feels tender when tested with a skewer. Cover the pie with paper, if it is getting too brown. When the pie is cooked, fill up with hot stock.